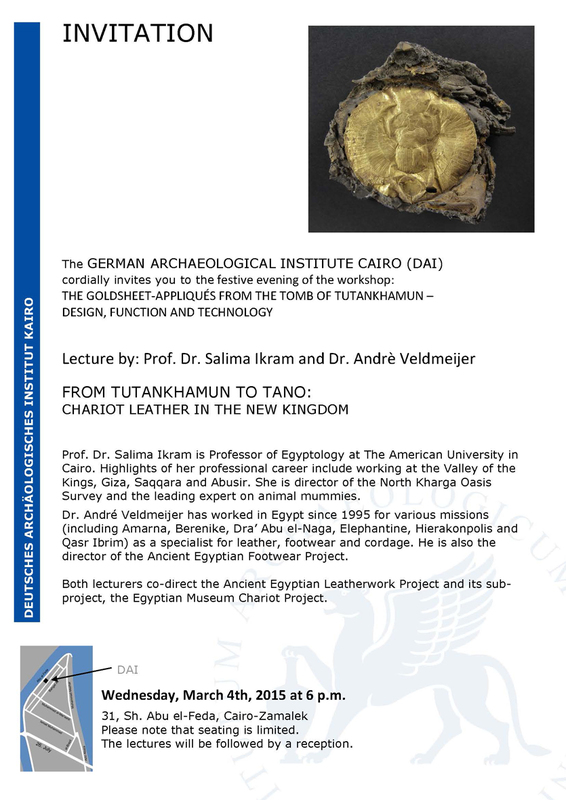 On March 4 and 5 2015 the workshop “The Goldsheet-Appliqués from the Tomb of Tutankhamun – Design, Function and Technology” will be held at the German Archaeological Institute in Cairo. This project works together closely with the EMCP, as most if not all of the goldsheet seems related to chariot: cladding of quivers, bowcases, casing etc. In the meantime, the analysis of the Tano leather as well as the comparative material from the tombs of Tuthmose IV, Amenhotep II and III, Maiherpri and TT 65 in Luxor are in full swing. Print article This entry was posted by andre on 25 February, 2015 at 7:06 am, and is filed under Uncategorized. Follow any responses to this post through RSS 2.0. Responses are currently closed, but you can trackback from your own site. Creasman, Pearce Paul, Hayat Touchane, Christopher H. Baisan, Hussein Bassir, Rebecca Caroli, Noreen Doyle, Hannah Herrick, Magdi A. Koutkat, Ramzi Touchan. 2017. An Illustrated Glossary of Arabic-English Dendrochronology Terms and Names. – PalArch’s Journal of Archaeology of Egypt/Egyptology 14(3) (2017), 1-35. ISSN 1567-214X. 35 pages + 52 figures. Harrell, James A. 2017. A Preliminary Overview of Ancient Egyptian Stone Beads. – PalArch’s Journal of Archaeology of Egypt/Egyptology 14(2) (tEBP Series) (2017), 1-16. ISSN 1567-214X. 16 pages + 2 tables. Theis, Christoffer. 2017. Egyptian Funerary Cones from Various Auctions and Collections. – PalArch’s Journal of Archaeology of Egypt/Egyptology 14(1) (2017), 1-25. ISSN 1567-214X. 25 pages + 2 figures. Harry M. Maisch, IV, Martin A. Becker, Ben H. Raines & John A. Chamberlain, Jr. 2016. Osteichthyans from the Tallahatta–Lisbon Formation Contact (middle Eocene–Lutetian) Pigeon Creek, Conecuh-Covington Counties, Alabama with Comments on Transatlantic Occurrences in the Northern Atlantic Ocean Basin. – PalArch’s Journal of Vertebrate Palaeontology 13, 3 (2016), 1-22. ISSN 1567-2158. 22 pages, 4 figures. Christophe Hendrickx & Matthew T. Carrano. 2016. Erratum on “An Overview of Non-Avian Theropod Discoveries and Classification”. – PalArch’s Journal of Vertebrate Palaeontology 13, 2 (2016), 1-7. ISSN 1567-2158. 7 pages, 1 figure, 1 table.